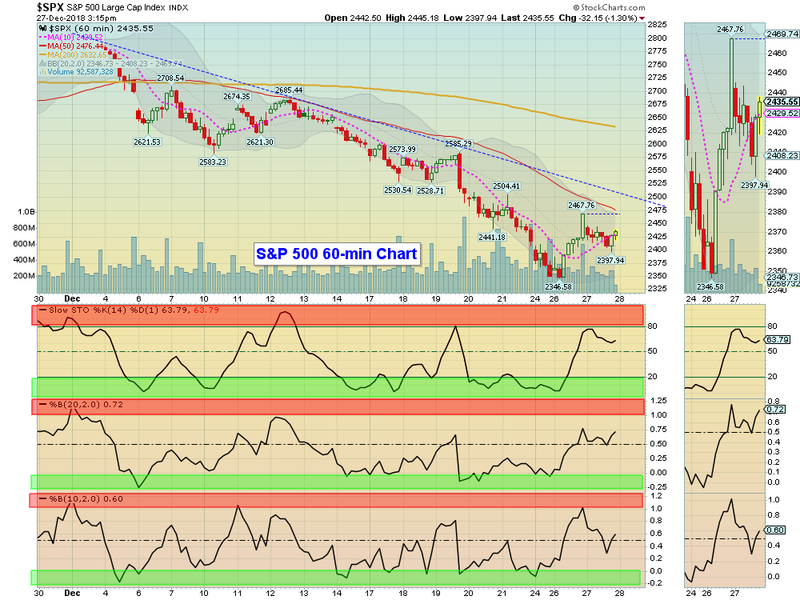 The S&P 500 needs to Close above the Pink Line of 2477. Markets were higher again today with low Volume as the S&P 500 tries to Close above the Pink Line Resistance (10-day avg.) at 2477. We are reluctant to buy more at this level as the Markets could go back down once more. The Inverse Funds (see Watch List below) are back down in the Green Zones for a Money Wave Buy soon. Longer term the Markets are extremely Over-Sold and should return back up towards the Green Line after backing and filling. Crude Oil was up $0.30 today at $45.75. 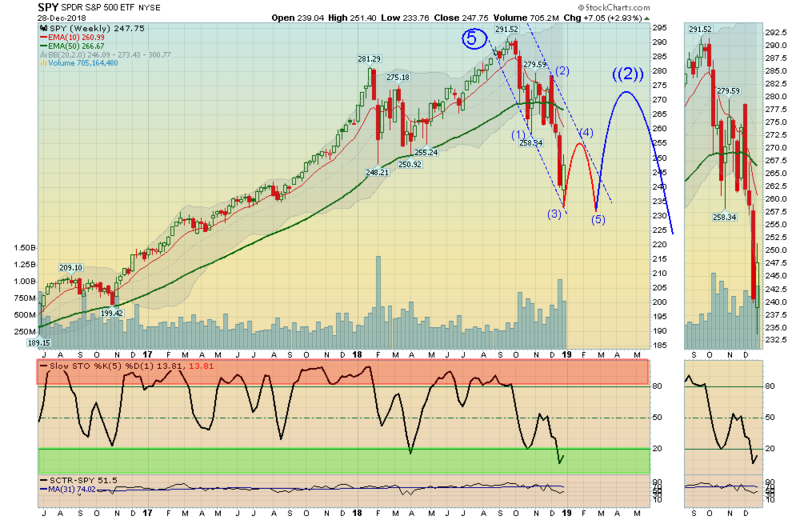 RWM INVERSE SMALL CAP FUND Money Wave must Close in the Green Zone. NIHD NII HOLDINGS Place Buy Stop Order above $4.49. EXIT CROX CROCS, INC. if it is going to Close below your Buy Price, or $25.97. EXIT ETSY ETSY INC. if it is going to Close below your Buy Price, or $47.21. LOWER the Sell Stop Loss on UNG US NATURAL GAS FUND to $24.00 until it bottoms. The Relative Strength is still 94 from ETFScreen.com, and UNG is back down in the Green Zone. Possible Elliott Wave count on the S&P 500. And then in a few months the sentiment and confidence could flip, and eventually the Herd and Tammy would pile back in. 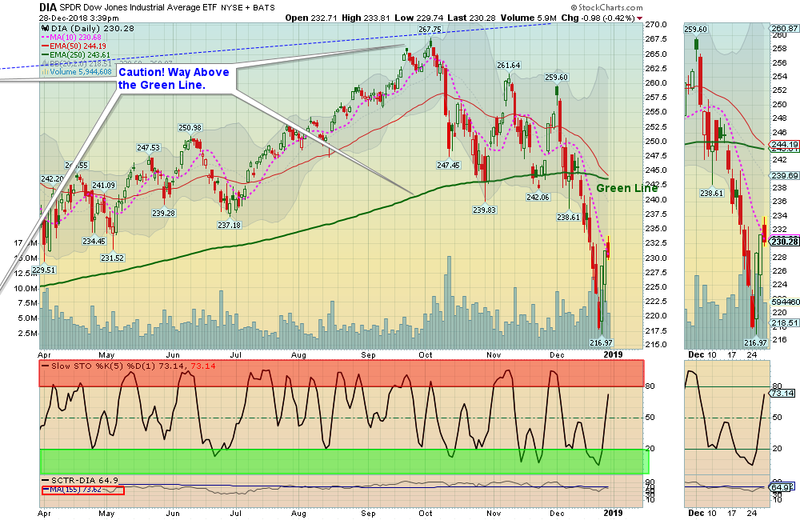 Eventually the Markets should bounce back up to at least the Green Line, once they bottom. For the week the Dow was up 2.75%, the S&P 500 was up 2.93%, and the Nasdaq 100 was up 3.95%. The very Long Term Trend on the Stock Markets is UP, but many Indices made 52-week Lows last week which could signal a Top has been made. The Inflation Index (CRB) was down 0.68% and is Below the Green Line, indicating Economic Weakness. Bonds were up 0.27% for the week and are Above the Green Line, indicating Economic Weakness. The US DOLLAR was down 0.64%, and could be topping as the FED is probably finished Raising Rates for a while (unless they purposely want to create a Slow Down). A falling Dollar could be good for Tech Stocks and Commodities. Crude Oil was down 0.57% for the week at $45.33, and GOLD was up 2% at $1283. We are currently in 13 logged Open Positions, for the Short & Medium Term. There are 3 Investments on the Short Term Watch List. WWE WORLD WRESTLING Place Buy Stop above $77.95 on the Close. Alert! Market Risk is LOW (Green Zone). The probability of successful Short Term Trades is better, when the S&P 500 is down near the Green Line. ANSWER: Hi Steve, Way Above the Green Line means that if you Buy up there, you will probably have a “Sick Feeling” when the Investment eventually returns to the Green Line. The DOW Index is returning back up to the Green Line. Markets were up slightly again today as the S&P 500 tries to Close above the Pink Line Resistance (10-day avg.) at 2488. The Markets have had a decent bounce off the Lows this week, as they were extremely Over-Sold and should return back up towards the Green Line after backing and filling. The FEAR Index is very high, normally indicating that the Markets are Over-Sold. Crude Oil was up $0.70 today at $45.75. EXIT RWM INVERSE SMALL CAP FUND if it is going to Close below the Pink Line around $47.10. This trade was not logged. S&P 500 went down to test the recent Low. Markets corrected some of yesterday’s Big rally by dipping back down about 1/2 way down. The next Resistance on the S&P 500 is the Pink Line (10-day avg.) at 2499. 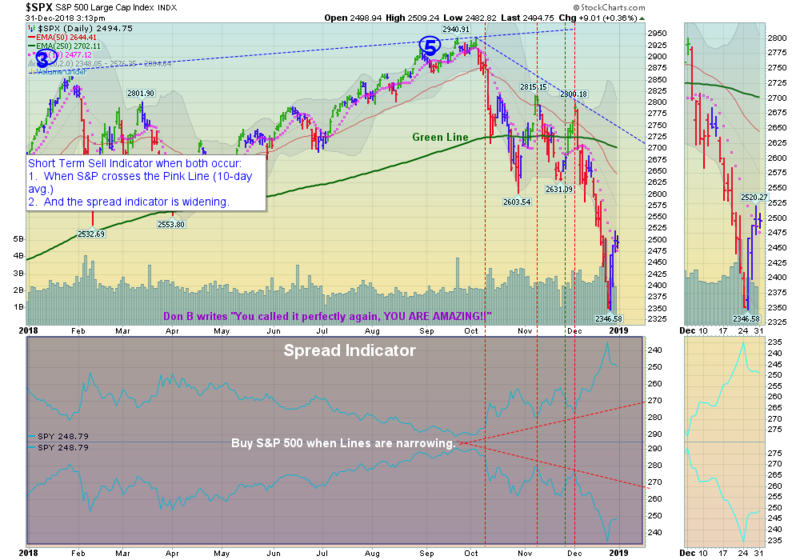 The Markets are extremely Over-Sold and should back up towards the Green Line once the temporary Fear subsides. High levels of human emotion are difficult to maintain for long periods of time. The FEAR Index is very high, normally indicating a Market bounce soon. Crude Oil was down $1.01 today at $45.12. CIEN CIENA CORP. Money Wave Buy today. Target is $36.00. Place Sell Stop Loss below Support of $30.77 on the Close. ETSY ETSY, INC. Money Wave Buy today. Target is $55.00. Place Sell Stop Loss below Support of $42.00 on the Close. LLY ELI LILLY Place Buy Stop Above $111.54. MCD MCDONALDS CORP. Medium Term Buy today. Target is $184.00. Place Sell Stop Loss below Support of $169.04 on the Close. SBUX STARBUCKS CORP. Medium Term Buy today. Target is $68.00. Place Sell Stop Loss below Support of $60.42 on the Close. LOWER the Sell Stop Loss on VKTX VIKING THERA. to $6.50 until it bottoms. Small Cap Inverse Fund is finally getting tired. Markets finally bounced up today on Low Volume, as the Markets were extremely Over-Sold. The Indices were stretched Way Below the Green Lines like a rubber band, and should snap back up towards the Green Line once Tammy Sells out on Fear. Crude Oil was up$4.11 today at $46.70. MRK MERCK & CO. Money Wave Buy today. Target is $79.00. Place Sell Stop Loss below Support of $70.89 on the Close. PFE PFIZER, INC. Money Wave Buy today. Target is $46.00. Place Sell Stop Loss below Support of $40.42 on the Close. TWLO TWILIO INC. Money Wave Buy today. We will not log TWLO, as it is already up 11% today. LLY ELI LILLY Wait for Close Above the Pink Line. 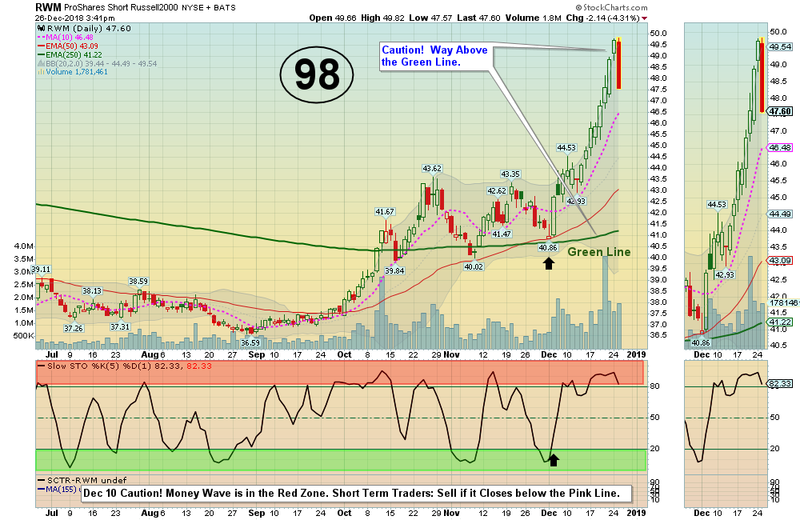 LOWER the Sell Stop Loss on UNG US NATURAL GAS FUND to the Green Line of $26.73 until it bottoms.